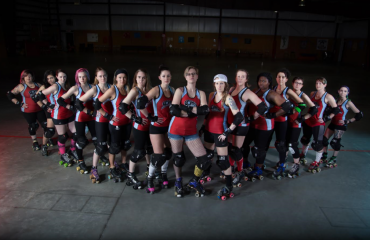 This year the WFTDA blessed all us derby fans with an updated ruleset. That in and of itself is enough to make a huge nerd like me run around, my fist pumping over my head, belting out the theme from Rocky at the top of my lungs. Not everyone is a giant freaking nerd, though. I get that. But even if you aren’t having an impromptu dance party just at the mere existence of new rules, this is still good enough news that should make you want to track down and high five every member of the WFTDA rules committee, and here’s why: the new rules are much, much simpler than the old ones. When you come to a bout this season, you should be able to see the difference within two seconds of the first whistle. Last year when a jam started there were people starting upright, there were people starting on their knees, and there were even people pretending to start on their knees. Sometimes the jammers would charge forward immediately into the pack of blockers waiting inches away from them, and sometimes the jammers just had to stand there waiting for the the second whistle. Trust me when I say that all of that did, in fact, make sense on some level, even if the only way to really understand it was to have a rollergirl explain it to you. What never made sense was why it was so complicated in the first place. There was no need for it to be that way, and now it isn’t. Now it’s simple and comprehensible. In the new rules, there’s only one whistle at the beginning of a jam, and it starts both the blockers and the jammers. It’s easy to understand, and the game gets going immediately. This simplification of the game doesn’t end there, though. It extends throughout the new rules, and the biggest sign of the WFTDA’s commitment to eliminating needless complication from the rules is the complete removal of minor penalties. Previously given for actions that were illegal but not too illegal, minor penalties were handed out constantly and often without anyone noticing, until suddenly a skater had four of them, and then she was unceremoniously sent to the penalty box leaving both her and the fans wondering exactly what she’d done wrong. 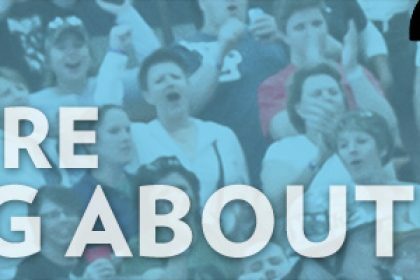 With minors gone, it should now be clearer exactly why a given rollergirl is headed to the penalty box. Shaded areas represent legal target or blocking zones. Diagram reprinted by permission of the WFTDA. You can see that if you were to lay a rollergirl face down in a giant taco shell, the areas of her body covered by the shell would roughly correspond to legal target zones, and if you were to wrap her in a giant tortilla, that would roughly correspond to legal blocking zones. There used to be a whole host of minor penalties for hitting outside of these lines that made your opponent stumble. Not fall. Not go out of bounds. Just stumble a little bit. Every single one of those is now completely legal. In fact, there were a whole bunch of other other ways to illegally make an opponent stumble and pick up a fourth of a penalty like hitting someone with a skate out of bounds, and nearly every one of those is also now completely legal. Not everything that had been a minor could be made completely legal, though. The most important reason for upgrading former minors into full penalties was safety. Blocking either from a standstill or while skating in the opposite direction of normal play can be incredibly dangerous, and outlawing the small-scale versions that barely affect a rollergirl’s opponent makes it “dangerous” in terms of strategy for a rollergirl to do things that might be even a little bit illegal, since it could leave her team down a person while she serves her penalty. Drawing the line between legal and illegal here creates a nice buffer between the strategically “dangerous” actions and the truly dangerous actions that could result in someone going to the hospital. fair to allow. 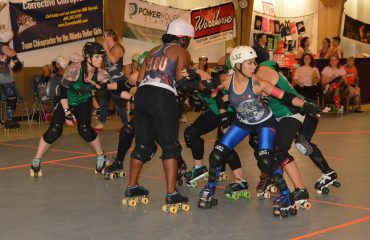 For instance, rollergirls aren’t allowed to grab onto each other in ways that create impenetrable walls of human flesh because it makes jamming pretty much impossible. Rollergirls hated that tactic so much that they made it illegal all the way back in the very first WFTDA ruleset. Now, it used to be that doing that for less than three seconds was only a minor, but I’ve more than once heard rollergirls describe the ability to dead-stop a jammer in exchange for a quarter of a penalty as “a bargain”, so when the only choices were to upgrade it to full penalty or downgrade it to legal action, the choice was clear: holding back an opponent by grabbing onto a teammate for any length of time is illegal. 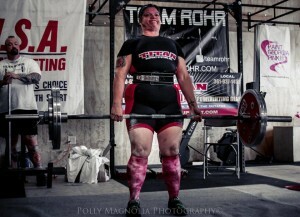 Similarly, it used to be a minor for a rollergirl to hold her hand or forearm on an opponent. If that doesn’t sound to you like something that needs to be illegal, you aren’t alone. The WFTDA didn’t start penalizing for it until mid-2010, which means that there’s a reasonable chance that you’ve been watching derby for longer than this penalty has existed. But consider this: if a rollergirl puts her hand on the back of an opponent in front of her, she can now turn to look behind her and still track every movement of the player ahead of her. It took rollergirls a while to understand how to fully exploit this, but once they did, it had to be outlawed. At the same time, rollergirls often skate in close quarters, and they can’t be getting majors every single time their hands touch an opponent, so the rules is that continuous contact for less than three seconds is legal, but holding it for three or more seconds is a penalty. After safety and fairness concerns were accounted for, it turned out there was a small group of things that needed to be illegal just to keep the sport intact. 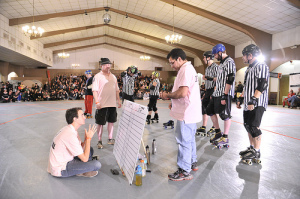 The whole system of scoring in roller derby is predicated on the idea that there is a pack where most of the blockers are and that all blockers will be in bounds and within 20 feet of the pack at all times. (Blockers farther from the pack than that are considered out of play and aren’t allowed to hit anyone until they return.) It’s not a big problem if a blocker or two ends up out of bounds or out of play for brief periods of time, and there are rules ensuring that no one gets penalized for things like stepping off the track to refasten a loose wristguard or getting caught up in chasing a jammer and ending up out of play, but if rollergirls are free to leave the track whenever they feel like it or to remain permanently out of play, the game falls apart, and so the minor penalties for not staying (or quickly returning) in bounds and in play had to be made into full penalties.